Ooooh, a third new post, I must really be back! To be honest, with the hectic summer I had with all that cooking in the hot sun, most of it done during Ramadan when I was fasting, this feels so good. It is therapeutic; just the action of typing out a sentence or two, or editing a photo whilst listening to music, the cooking’s a bit chaotic but for the most part, it’s been wonderful to get back to blogging and catching up with old friends. I know I have been a bit erratic visiting everyone but I promise, I’m coming! I have finished my events for the year, I think and am looking forward to concentrating on my website, visiting all of you and maybe throwing a party or two. Today’s post is not so much about the recipe, though the Herb Grilled Chicken is pretty delicious and became quite the hit this summer, it’s more about the experiences and adventures I had this summer. One such adventure was had last week at a metal workshop where they work with….metal. I should say, not just work, but design and create, the most amazing things with metal. I was, for lack of a better word, gobsmacked, at their workshop, their products and the great people who worked there. Since this was an evening event for a design association, they had transformed their big, old metal shed into the most graceful, rustic venue for the dinner/meeting. The textures, colours and ‘vibe’ were eclectic, artistic and so original. The huge metal workshop tables were covered with colourful, floral prints, and while metal cutting and fabricating tools hung on the underside, vibrant, yellow sunflowers adorned the top side. The whole cold metal, warm fabrics, sunny flowers and the earthy, rustic feel, played so well together and worked beautifully. As much as I loved the whole atmosphere, I loved their creations even more. So much talent and passion in this place and it can be seen by the way they talk about what they do. Raw Urth is located in Fort Collins and they basically design anything with metal. They are local artisans and if you are looking for something that’s unique, different and custom made, then you need to check them out. Why is it that in this day and age, the craftsmen and the artisans are often overlooked? The ones who produce works of art, one of a kind pieces with so much passion that it can be seen in every stroke of their paint brush, every nail or every carved line; in a slice of artisanal bread or a cup of perfectly, crafted coffee. Even modern technology has its artists because I see beauty in a sleek, elegantly designed Aston Martin, or a shiny, gleaming Harley thundering off in the distance (I’m still working on getting mine, I figured I’d fix my knees first so I could ride the dang thing). My heart skips a beat when I see beautifully, crafted audio speakers or huge, powerful amplifiers, that fill the room with such a precise and soul wrenching sound. All these designs and creations require a desire for perfection. But in all this modernity, we seem to have forgotten the true art of creating and crafting. It’s so much easier and cheaper to go to IKEA or order from Amazon or walk into a Starbucks. And yet, thankfully, we still have these souls who take the time to create, carve and cultivate. Let me tell you how excited I was to see a real anvil! I have a good friend, who I don’t see very often and talk with even less, but we’re friends nevertheless, and on one rare occasion where we had the opportunity to converse, he showed me what he can do. What he can do, and do very well, I might add, is work with wood. He showed me photos of his past jobs: cabinetry and wood work. It made what I do seem incredibly insignificant! I just throw a bunch of ingredients together and hope for the best but here he was, all artisanal and cool, I was, I am, in awe. I knew he did this on the side but I didn’t know he was this brilliant. So, what do you think? Are food bloggers artisans? Are we special in some way? So, moving on to the recipe, the marinade and the sauce for this chicken is very much like a chimichurri and a Moroccan chermoula. I kind of didn’t stick to any hard and fast rule and mixed and matched so I didn’t want to call it either but it is inspired by them both. The chicken was marinated in the sauce for about an hour and then grilled and served with more sauce on the side. I know it tastes good because everyone told me so. And it does, it’s quite excellent. A tart, sweet herby sauce that marinades the chicken and is also served along side. Put all the ingredients for the marinade and the sauce into a food processor and whiz till pureed and blended. Check for salt, pepper and sweetness. Adjust the vinegar for more or less tartness. I like a bit of honey to take off the vinegary edge but if you like it tart, you can omit the honey. In a plastic baggie, drop the butterflied chicken breasts. Add a ¼ cup or so of the sauce to marinade the chicken. Zip the bag and mix the marinade around to coat the chicken. Fire up the grill, and grill the chicken breasts till done. They shouldn't take too long since the breasts were sliced to be thin. About 10-15 minutes on the first side and about 7-10 on the other side depending on the thickness. Pull off the heat and allow to rest awhile. There are no tules to this marinade, check the seasonings and adjust to your liking. The above quantities is how I liked it, but you may like it more sweet or more tart. Just taste it! So, I found this quote the other day and thought it quite appropriate, I’ll leave you with it. Have a great week. That is quite the workshop indeed! Yes, I do believe passionate food bloggers are artisans as well. The grilled chicken looks delightful and is packed with flavor. The flavors sound so good. My family will enjoy this meal to the core. Thanks so much! The flavours are awesome here, hope they do enjoy it! Food bloggers are absolutely artisans in their own right! Although it may not be considered traditional, there is an art to food styling and photographing food in its natural element. Oh yes, you’re sooo back! I love your herb chicken!!! So god to have you back,Nazneen! The metal workshop sounds very interesting and like great fun and the grilled herb chicken……yummy. Whatever those antler/angel wings are up top I want them! They are just beautiful. You’re so right true artisans are so under appreciated nowadays. Anything herbed catches my attention. Herbed Chicken can only make a gorgeous meal. Such an elegant dish and as always the photos made me hungry. As you mentioned, art is when you completely immerse yourself into something and believe in the beauty in it. You create with your soul. I know a lot of bloggers who do that and you are one of them. Would have been a lot of fun! But after a long day, nothing like coming home to your incredible cooking – what a delicious looking chicken, that golden colour is perfection! that chicken looks FABULOUS! ))) x Send some to Minnesota, please. Thank you!! I can most definitely send some to Minnesota! That’s an interesting and fun experience! 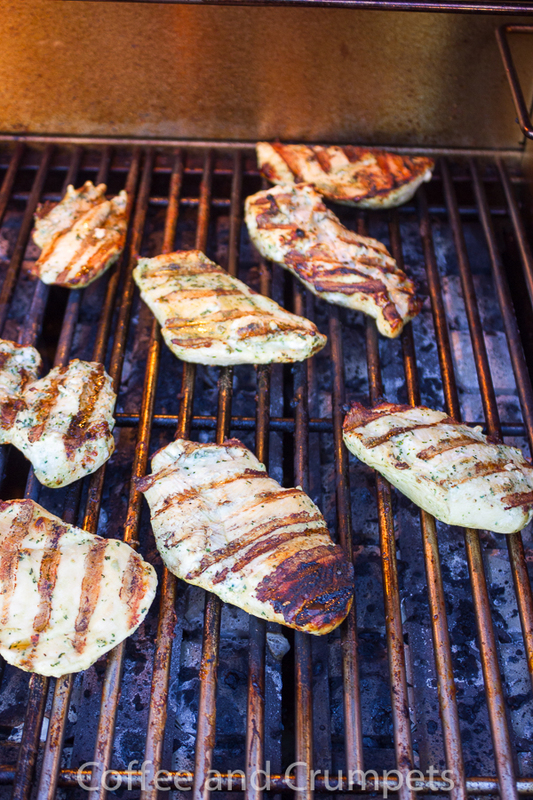 Tangy, sweet, and herby…I love the flavours of this grilled chicken. Thank you Angie! I had a great time. Wow – these are awe inspiring works of art indeed! Thanks for sharing Nazneen! I love this line from your post “The ones who create the most beauty are the ones who put all of themselves into it; they are passionate, they are perfectionists and they are principled” and yes, you are most definitely a passionate and creative food blogger – I mean, just look at this chicken! I am loving that mint, cilantro and parsley paired with the balsamic and cumin and honey! YUM! Shashi @ runninsrilankan recently posted..Chicken & Cashew Curry Recipe …& TECHmunch! Thank you Shashi! You are too sweet. I had a wonderful time and loved admiring all their hard work. I feel embarrassed at all the praise I get with food and yet I put in half the amount of work as others. But I do have passion!! What an experience! Great looking chicken. I have some marinating right now and our marinades are very similar. Instead of vinegar I used 2 small ripe tomatoes! Thanks Mimi! Ooooh, your chicken sounds good too! Looks amazing, as usual… and I like how you speak of artisans, and question what we do. I sometimes feel the same way, but I do believe we each have our niche of expertise. I read hundreds of blogs and I have to admit that the ones I follow are true artists. Yours, for example, for your food and photography craft. I tend to gravitate to bloggers who are both incredibly talented but also warm and kind. I think I look for the same in artists. Humility is a lost art. I used to work in the performing arts and nothing turned me off more than someone who thought they were better than the rest just because they could sing/dance/play/act/write. Same with sports figures. And politicians. We are all the same, and each of us shines in different ways. No one should get special treatment, yet we should all be treated specially. Thank you David! I loved reading your comment and totally agree with everything you wrote. I too, am drawn to warm bloggers, the mines who share themselves a little and talk about life as well as food. I’ve tried to share my life a little bit at a time…though sometimes it seems y’all know more than my family! And yes, humility is a lost art. Thank you for your sweet words, I don’t think I’m good but I do love it and maybe that’s what shines through. Passion makes even the mediocre quite excellent. I’d say anyone who tries to cook well is an artisan. So yes, food bloggers are artisans (particularly when it comes to the photography!). Lovely chicken — terrific recipe. Thanks. Hi John! So nice to hear from you again! How was your break? I hope you are well rested and ready to give us some amazing drinks and food. I am glad to hear you say that we are artisans. And definitely, your photography is wonderful and so original. You my friend, are a true artisan. Chicken is the meat most often consumed in my household. Your grilled chicken looks mouthwatering, Nazneen. I am glad that you are back and had a deserved break. The sculptures are gorgeous as well as the sunflowers. Have a wonderful day! Thank Denise! At our house too, we eat chicken mostly. This was a great recipe, very flavourful. I really needed a break and it feels great to be back! I had been waiting for this post. You lucky duck! what a fantastic experience.